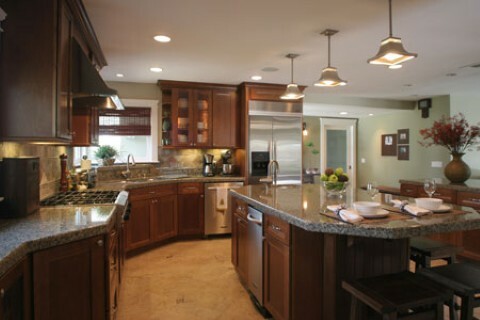 Activity-based, or zone, kitchen designs are a new approach to a simpler kitchen layout. They are an expansion to the traditional essential work triangle of sink, stove, and refrigerator created with the idea of convenience. They cater to homes with larger families, homeowners who entertain, and people who spend most of their time in and around the kitchen area, making it the focal point. The first three necessary zones include the cooking zone, storage zone, and washing zone. The cooking zone includes the stove and its adjoining spaces. You will most likely find cooking and baking prep counter space, smaller cabinet storage for utensils, spice racks and miscellaneous drawers. The storage zone is shaped to accompany your fridge, so that all your dry goods are close by the refrigerated items. Some homes may design extra counter space into this area to drop groceries off on. A key idea is to keep this area away from the stove or sink to alleviate any traffic problems. The washing zone will include the sink area, dishwasher, and any additional pre-wash stations if included in the kitchen. The dishwasher is normally placed directly to the right or left of the sink for quick transfer of wet dishes. In many kitchens the sink is designed to be the centerpiece of the room, decorated with ornate tile backsplashes or placed near a scenic window.